Should you spend Rs6.8 million on this powerful beast made for off-road trips? Keep reading to find out. 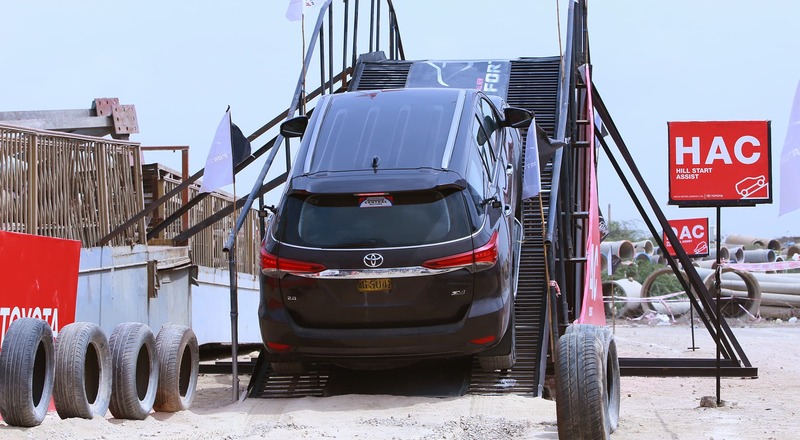 Toyota recently organised a three-day experiential drive in multiple cities of Pakistan to test the capabilities of its new Fortuner Sigma-4. The event, which began with a safety briefing, gave adventure enthusiasts a chance to drive the brand new vehicle across bumpy roads, a rocky surface, side inclines, as well as a watery, slushy terrain. The key goal here was to test the Fortuner Sigma-4’s various off-road features including the HAC (Hill Start Assist Control) and DAC (Downhill Assist Control), and it demonstrated its power quite effortlessly. I have seen a similar obstacle course that Toyota built internationally on Youtube previously. I specifically remember one episode where Toyota used the Land Cruiser on a public square in Japan to give onlookers a joy ride of a lifetime. The experiential drive at Karachi was quite a thrilling experience, as the drive included steering the Fortuner up and down an inclined slope, followed by driving on different kinds of surfaces and conditions you may come across on an adventure trip. These included a muddy terrain and a bumpy road with obstacles. 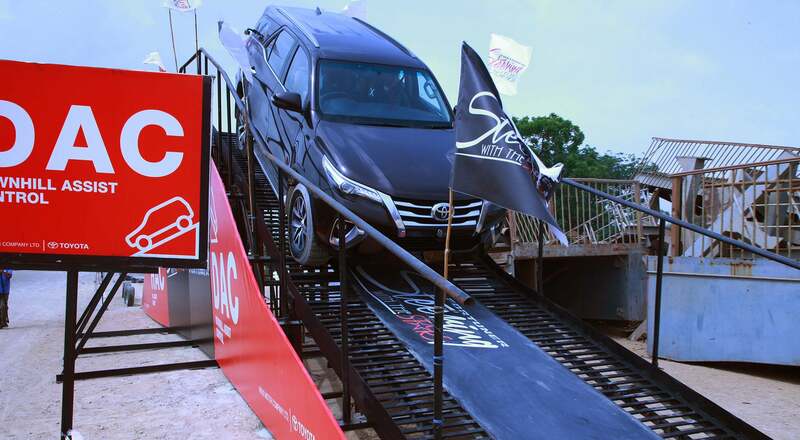 The best part of the experience for me was climbing up on the inclined slope: the Fortuner's HAC (Hill Start Assist Control) lets you drive up the ramp quite easily with complete confidence, and then come down even more easily. Once at the top, you can engage the DAC (Downhill Assist Control), and concentrate on steering the vehicle. The in-built system adjusts the vehicle’s speed and braking itself to make sure you come down effortlessly. The drive was smooth on all kinds of obstacles, and quite enjoyable despite the bumps and murky paths that are bound to test any vehicle's power and capabilities. The previous generation Fortuner was a bare-bones SUV, but the new one is packed with features that are quite impressive. The full set of specs can be viewed here, but even at a first glance, the new 4X4 packs a definite punch when compared to previous models of the SUV in the market. The powerful 2.8L 1GD diesel engine has been introduced in 2018, and is quieter, more powerful, and gives better fuel economy than its precursors. There’s no conventional loud roar that most diesel engines make when you put the pedal to the metal. The obstacle course that Toyota built established the fact that even a steep slope took minimal effort from the engine to climb. The Fortuner Sigma-4’s offroad system is one of the most capable ones out there, with the right amount of computer driven involvement that doesn’t takes away the fun from off-roading and adventure. The HAC (Hill Start Assist Control), for example, lets the vehicle climb on slopes without sliding backwards when you let go of the brakes. The new Fortuner has been introduced with bi-beam LED headlamps with DRL (Daytime Running Lights) as well as LED fog lamps that were absent in the previous models. The chamois leather interiors are classy and luxurious, and enhanced features like cruise control and electric powered driver seat add to the overall allure of the vehicle. Perhaps the most surprising feature I found was the power back door which you can open by the touch of a button on the car key or the door itself. Toyota has also emphasised on the safety capabilities in the new 4X4, with features like (VSC) Vehicle Sstability Control and (EBS) Emergency Brake Signal. The new vehicle also comes with dual A/C, push start, smart entry, and side-steps.The biggest complaint most people have with locally assembled vehicles is that they don’t have features that most modern cars come with, but the Fortuner Sigma-4 has all of them and more. To sum the vehicle up, I think it offers great value for money and gives a decent mileage and city ergonomics for a vehicle of that size. Plus, when you’re seeking adventure, the Fortuner can easily navigate the steepest of hills and a variety of terrains without breaking a sweat. This content was produced in paid partnership with Toyota Pakistan and is not associated with or necessarily reflective of the views of Dawn.com and its editorial staff. Of course the top quality brand with the best features available in its class category, but from regional perspective, quite expensive. I confirm that all the features of Fortuner mentioned in this article are there in this vehicle and I'm a happy buyer of Toyota Fortuner. Looks similar to Toyota Highlander sold in America. Why is there no mention of Airbags in the safety paragraph? Why is Toyota selling an underpowered 4 cylinder 2.7l vehicle sold in other countries as highlander priced at levels of a land cruiser? @Sanjrani because this crucial feature is compromised.